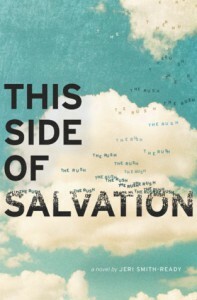 This side of Salvation by Jeri Smith-Ready is a wonderful story about family, friendship, love, loss and freedom. David, the main character is in a very difficult situation because after the death of his brother his parents became religious, like hard-core religious, and David doesn’t know what to do. Because David is a normal teenager, he wants the things all the boys his age want. So, personally, I think this book takes a topic that catches my attention: how people mix religion with fanaticism. This teaches us that it’s good to have God in our life but in a healthy way. But don’t get me wrong, TSOS is not a religious book; it’s a contemporary story with a religious topic. Jeri Smith-Ready amazed me once more with her gorgeous and light writing. TSOS is fast paced read with wonderfully written characters and a mysterious plot that will keep you on the edge of your seat. And the characters… oh my, oh my, these characters were phenomenal! David: He is a baseball player that leaves everything for his parents’ will, because he’s a good boy, he respect them, and he’s struggling with his unknown future. Bailey: She’s sweet and funny. She’s a geek, she’s a free spirit. Mara: David’s sister is the rebel, she’s good as well, but she’s strong and she knows what she wants for her life. David’s mother: She’s passive. She loves his children but she doesn’t set her own rules, it’s like she thinks what her husband thinks. The other characters took a special role in this story, like Sophia and Kane but I rather not to tell anything about them. Just let me highlight how incredible is this author at creating all sort of personalities. And like I said, the writing is just as awesome as everything Jeri Smith-Ready writes. This Side of Salvation is not just hard topics and heartbreak, This Side of Salvation has everything you look for in a contemporary story. Sometimes is fun, sometimes is sad. It has mystery and a sweet romance. The only problem I had with this book is that I don’t like books narrated in “Then” and “Now” I don’t like going back and forth because, call me crazy, but I always skip the “Then” part. I like to know what’s happening right now. That’s why I read This Side of Salvation twice. Once it was a 4 stars book: when I read it the way it’s written. Then, it was 5 stars: when I read first the “Then” part and then the “Now” part. My brain just works this way. Overall, you just can’t miss This Side of Salvation. It’s unlike everything you ever read. And now let me show you the quote that made me laugh like a manic. Note that this quote was taken from the ARC and it can change in the final copy.